It was a lovely fall day so we took a hike through Six Mile Run Reservoir. This is normally where I ride my Salsa but I wasn’t sure if the trails we would be OK after the snow we had a week ago. They were indeed OK and it was quite lovely walking through the woods. It was a much different experience then riding through at a much higher rate of speed. It was very relaxing. When I got home, I decided to pop open beer #342, Whiteout Wit by Anchorage Brewing Company. Another beer and probably my last from Alaska, this Witbier has an ABV of 6.5%. It poured a pale yellow or gold with quite the large foamy white head. My first thought on smelling it was it had a sour smell to it. Wheat was the other thing I smelled along with wood (makes sense…this was aged in oak barrels). The taste is more of that sourness with some lemon..with a bit of the bitterness like you get from chewing on the lemon peel. It had a bready flavor to it along with a buttery, almost wine like thing going on. The body was between light and medium and the carbonation fairly low. It was quite easy to drink. This was an odd bird for me. It was quite unique with some of the qualities more like a white wine than beer. At times, I thought I was drinking a lightly carbonated wine. I’m not quite sure I liked this all that much…my wife enjoyed it much more than I did. Ehh…send it to the peasants. 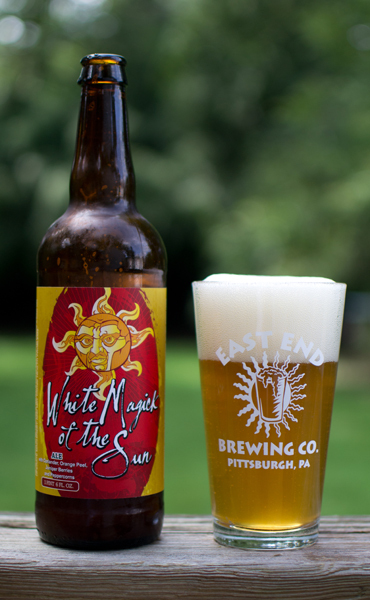 Beer #295 is White Magick of the Sun by Voodoo Brewing Company. 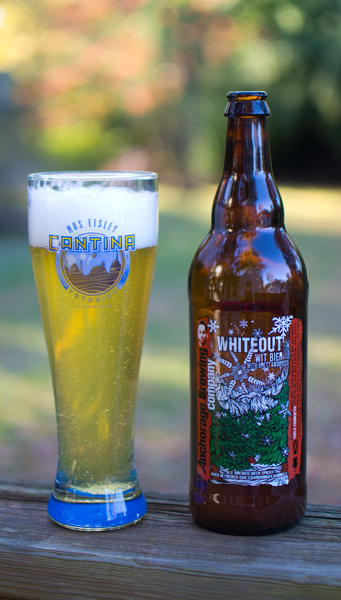 This Witbier is brewed in Meadville, Pennsylvania and has an ABV of 6.75%. It poured a hazy golden color with a generous sized off-white head. The nose was interesting, citrus and black peppercorn. It reminded me of the smell I get when I refill our black peppercorn dispenser. The wheat was there…just a bit muted or probably because the peppercorn was pretty strong. Orange and cloves kicked off the taste. The wheat taste is present throughout most of the drink. The black peppercorn hits near the end and there is also a slight bitterness. I got a bit of a sour taste also that sprung up near the end also. It was quite dry. The body was somewhere between medium and light. It had plenty of carbonation. This beer was very spicy. There was also a flavor here that was bugging me that I couldn’t quite identify…a bit fruity and slightly sweet. This was solid brew. If you dig spicy beers, give this a try. The day after Irene brings repairs and cleanup and beer #274, Partly Sunny by Ithaca Beer Company. Their version of a Witbier has an ABV of 4.9%. Partly Sunny poured a cloudy pale gold with quite the frothy white head. The nose was lemon and wheat and spices like coriander and cloves. Those aromas carry over into the taste with the spices of cloves and coriander followed by a nice almost mouth puckering lemony flavor. It finished dry and with a nice hoppy bite. It had a medium-light body with some nice, not overpowering carbonation. It was quite crisp and refreshing. I like Witbiers and I liked this version. This would make a nice summer beer that even non-craft beer drinkers would enjoy. Hurricane Irene walloped us with a ton of rain. So much that our basement was flooded with 18″ of water at the high point. We also have no power…but a neighbor was nice enough to let us plug our sump pump into their generator. We shall see how that goes. In the meantime, I drank beer #273, Double Wit (ABV 7%) by River Horse Brewing Company from Lambertville, New Jersey while standing in freezing cold brown water while emptying out our basement of things I don’t want destroyed. So no review or picture today but I was able to keep the 365 going by blogging this on my HTC Trophy smartphone. Lets hope PSE&G gets our power restored soon. Until tomorrow….stay safe and stay dry. Beer #234 is Belgian Style Wheat Beer by Horny Goat Brewing Company. Yep…Horny Goat Brewing Company…as soon as I saw the name of the brewer, I had to pick this up. It came in a variety 12 pack so for the next few days it will be all about the Horny Goat. This Witbier is brewed in Stevens Point, Wisconsin and has an ABV of 5.2%. Into my tulip glass went this hazy golden orange brew. Just look at that head…oh wait…there was none. It had a pretty light aroma that reminded me of orange soda…and that was it. Where was that familiar Belgian style yeasty goodness I’m used to? Wow…very wheat-y in the taste department with an herb-y flavor near the back end. I didn’t get any of the orange I smelled in the taste. The mouthfeel was that of a medium bodied brew with a ton of carbonation that made it a bit on the fizzy side. Below average but far from horrible. I have had far better Witbiers…Allagash White FTW! (For The Win)…heck even Sunset Wheat by Leinenkugel is better than this. Oh well…back to Potter Fest. Yankees (yeah baby!) vs. the Red Sox (boo)…battle for first place in the American League East. Good stuff…even better if the Red Sox go home with their tails between their legs. Lets go Yankees!!! Time to watch and crack open a beer. 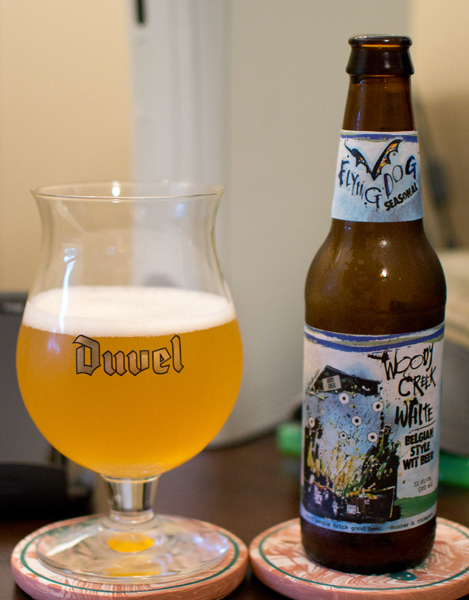 Beer #191 is Woody Creek White by Flying Dog Brewery from Frederick, Maryland. This was an easy drinking beer, very light in both the flavors and the nose. A decent Witbier that the wife liked more than I did. Ahh but what does she know being a Queen and all…Kings know best…don’t they? 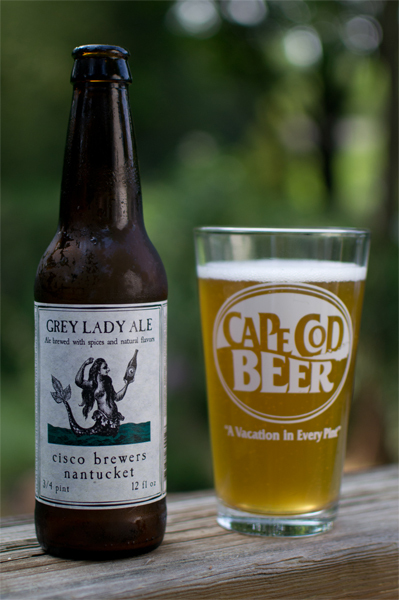 Beer #180 – Grey Lady Ale by Cisco Brewers Inc.
Grey Lady Ale by Cisco Brewers Inc.
Beer #180 is Grey Lady Ale by Cisco Brewers Inc. This is a Witbier with an ABV of 4.5% and hails from the island of Nantucket, Massachusetts. It is named after the island of Nantucket itself which is often referred to as “Grey Lady” due to the fog that often covers the island. Into my Cape Cod Beer glass this went with a kind of pale hazy golden yellow. The head was quite small and white. I took a whiff and got a faint spicy lemony aroma. The taste was a bit of wheat and the lemon like citrus found in the nose. There was also a bit of bready malts and quite a bit of a spice of some kind I really couldn’t identify. It was kind of thin body wise with low carbonation. This really wasn’t my thing….not horrible just not for me. It was a bit too lemony and spicy for my taste.